Oh my are we ever excited! Can you feel it? The impending sugar rush and thrill of canvasing the streets after dark, to come home with a pillow case of candy! The day and night that gives-way to you being able to dress up however you choose? Spooky, cute, funny, regardless of the how you want to dress up, Halloween Alley has the kids costumes you will need to make the night memorable. Do you have a little brood that will hit the streets trick or treating this year? Stats Canada said that the numbers from 2016 noted almost 4 million children, between the ages of 5 and 14 went door-to-door, Trick-or-Treating! Wait Your Turn. Don’t rush in if other trick-or-treaters are already at the door. Stand back and wait until the group has left and then approach the door. Ring the Bell. Ring only once. If no one comes to the door after one ring, move on to the next house. Trick-or-Treat, Please and Thank You. Say trick or treat and please when someone answers the door. Say thank you after you receive your treat. Don’t be Picky. Don’t search through the goodies looking for the perfect treat. One Piece. Take one piece of candy unless the host insists you take more. Respect the Property. Stay on sidewalks and off of neighbourhood lawns. Don’t throw candy wrappers on the ground. Closing Time. Trick or treating should end by 9 o’clock or sooner. Not interested, or able to hand out candy to little ghost and goblins? Lights Out. No light means no trick-or-treating. The troops will pass over homes if their lights are turned out. One other important thing to remember for the hosts, are food allergies. 500,000 children under 18, have a food allergy in Canada. Fortunately, Food Allergy Research & Education (FARE), created The Teal Pumpkin Project®. This initiative promotes safety, inclusion and respect of individuals managing food allergies. This movement offers an alternative for kids with food allergies, as well as other children for whom candy is not an option, and keeps Halloween a fun, positive experience for all! 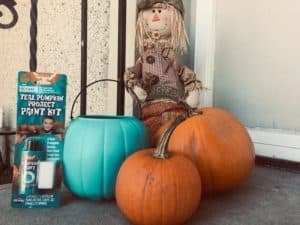 Paint your pumpkin teal and display it outside your home. Halloween Alley carries a FARE branded pumpkin painting kit to show your commitment to keeping kids safe. Tell your families and friends and ask them to join the campaign check out the Teal Pumpkin Project for more information. Keep your eyes open, and watch out for those kids in costumes roaming the streets. Stay safe and have fun!